We were quite pleased to be chosen for the new City of Carver website and put together an easy to navigate, easy to maintain site. After that site was launched we created a blog site for the mayor, Greg Osterdyk. 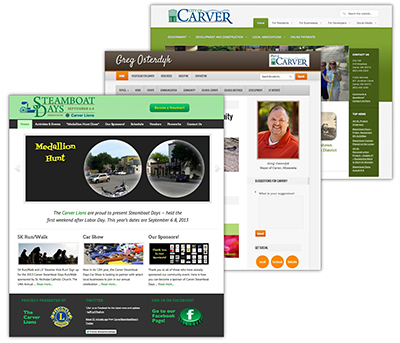 Lastly we built a site for Carver’s annual Labor Day weekend community celebration called Carver Steamboat Days (which you should attend, by the way). Each website obviously had its own unique requirements. Our consideration for each was ensuring that the site met both the needs of those creating content to communicate through the blog or website, and especially to those people who visit each one!